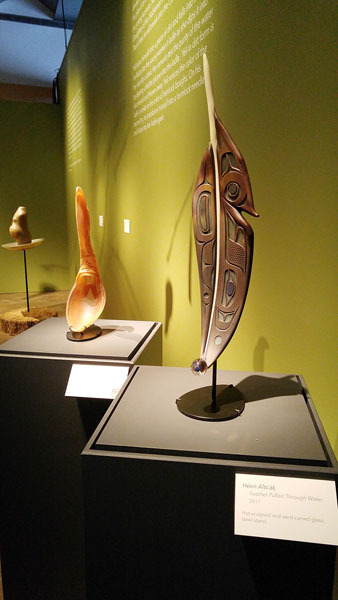 Before we flew back home we took a day to visit Tacoma’s Museum of Glass. 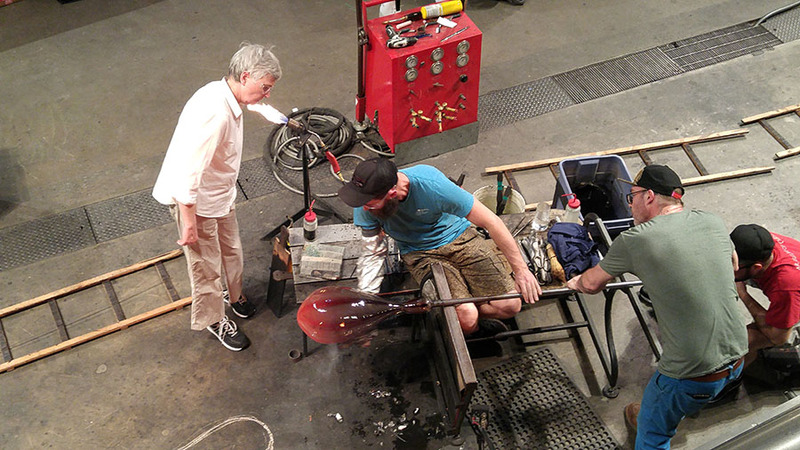 There are exhibit halls as well as a working “hot shop” where you can watch glass art being made by the Museum’s team or by visiting artists from around the world. The day we visited there was a Swedish artist working in the shop, making a large teardrop shape incorporating lots of glass canes. It’s really neat to watch the process throughout the day. 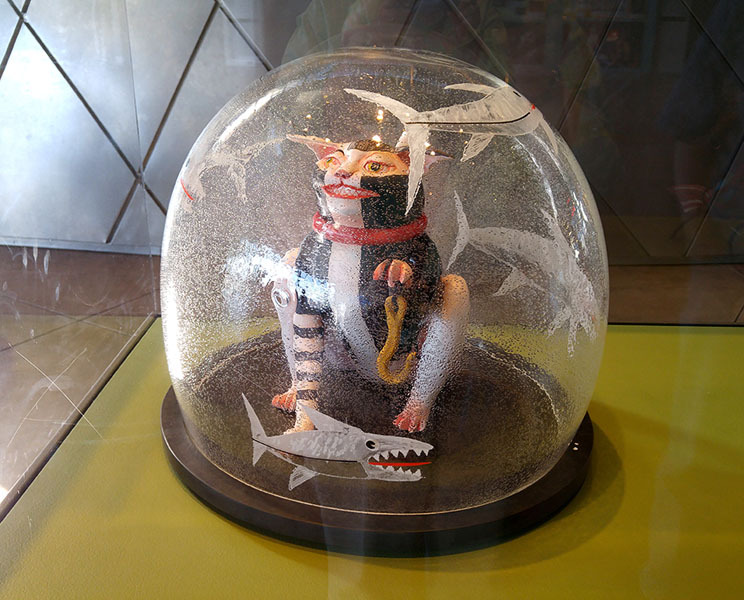 One of the galleries was closed while they changed exhibits, but the glass art in the hallways was just as fun to see. 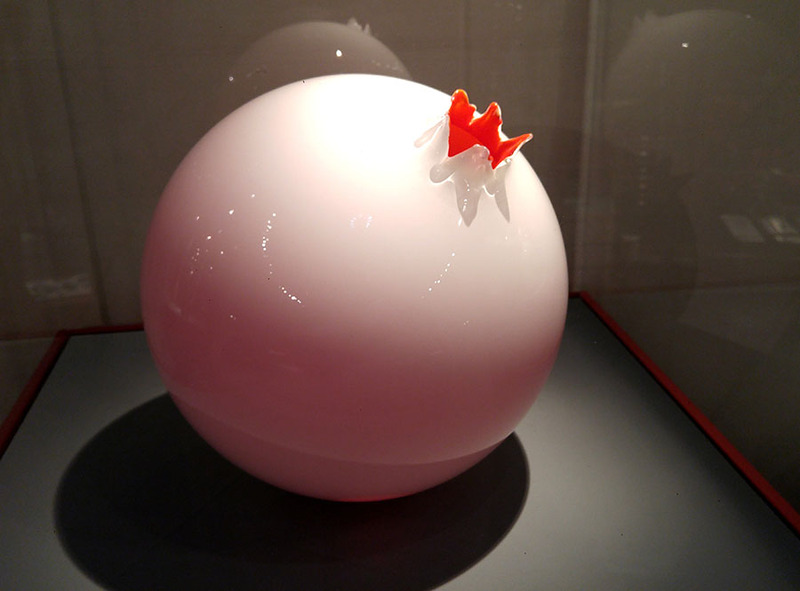 The various galleries are always changing, featuring a particular artist or style of glass art. The range of things that can be created in glass boggles the mind! 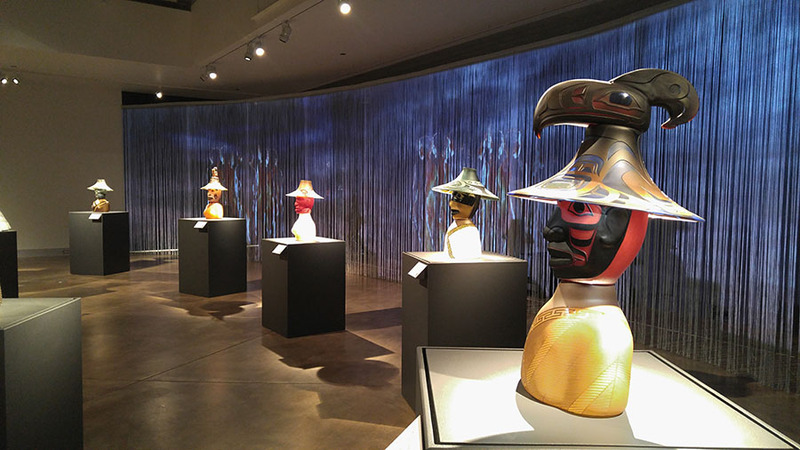 We stepped into the open gallery to find an artist that we’re familiar with – Preston Singletary – a Tlingit whose work we’ve admired many times. Wow! This is all GLASS… sometimes with a matte finish, sometimes opaque combined with translucent elements. 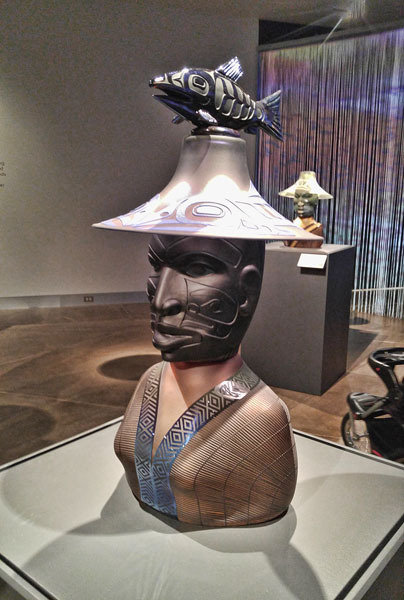 The small items were beautiful, but the canoe and collection of busts were amazing. 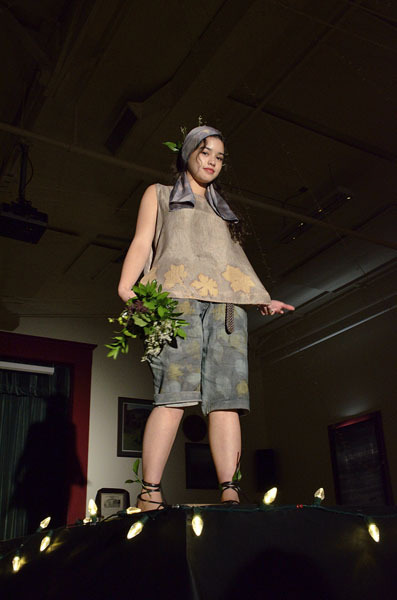 …and the pieces below showed how to use objects from nature and natural dyes to decorate clothing – done by a local botanist. 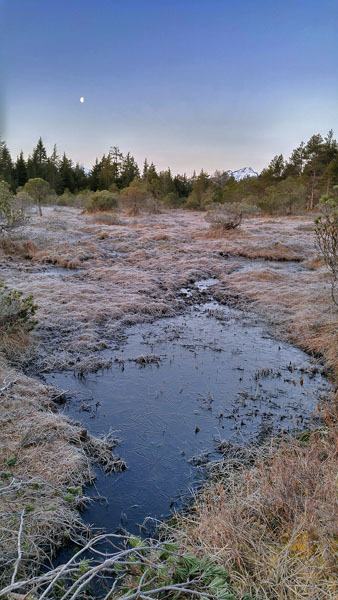 Mother Nature got in on the artistic theme with a dusting of frost on the muskeg in the early mornings, and geometric patterns as ice started to form in the kettle ponds… only to thaw in the sunlight and repeat the process overnight. We really miss our town when we’re away, especially the strong sense of community. Everyone sticks together and helps one another, which is important when you live on an island. During the ridiculously long Federal government shut-down, many businesses and groups in town stepped up to help people impacted by it, particularly our Forest Service and Coast Guard contingents. And after it was all over, those groups took out ads in the paper to say “thank you” and posted this nice sign on the message board outside of the Forest Service office. Classy. It’s just another example of why we love it here. And we know how to have fun too! 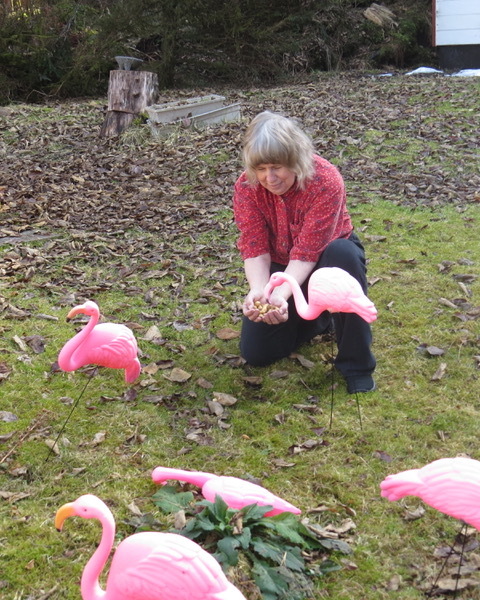 April is the annual fundraiser for the Humane Society where you can have a flock of plastic pink flamingos installed in someone’s yard for a day. 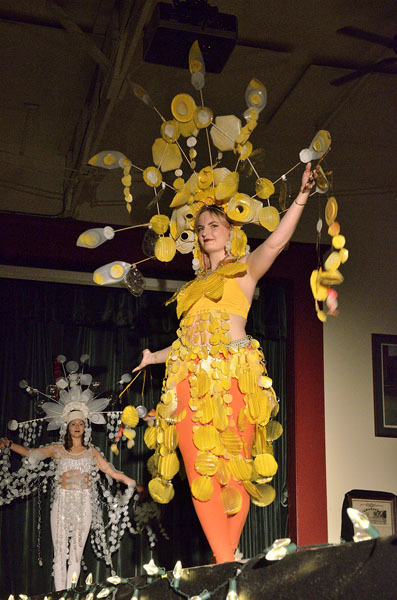 A donation will get someone “flocked”, and the “flock-ee” makes a donation to get the birds removed. Or you can buy “anti-flock” insurance. 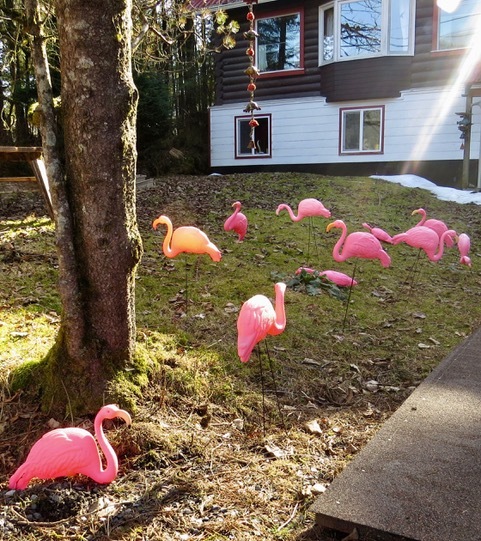 We flocked some friends (who can’t retaliate since the flamingos can’t come down to the harbor! 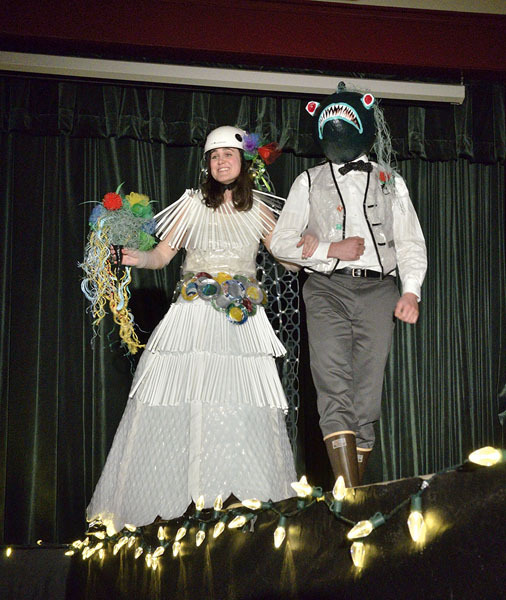 ), and they sent photos. Karen loves all animals so she offered the visiting birds some peanuts, but reported that they didn’t like them. I said I hoped they didn’t make too much mess in their yard and Don replied, “flamingo poop everywhere.” Oh well, it’s all for charity! The deer are wandering around town, starting to nibble on the skunk cabbage shoots as soon as they appear, and I’m sure they’re eating any flowers they can find. I spotted a male orca cruising up the Narrows while walking one morning, and people’s chickens are starting to wander around – sometimes disappearing when a lucky goshawk or eagle stops by. You just never know what you’ll see! 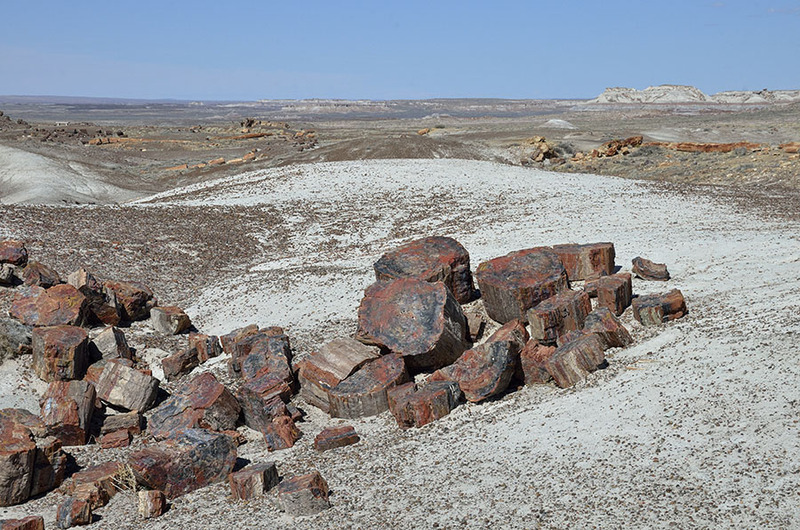 We managed to pack a few more adventures into the last of our road trip, starting with the state park where we camped near Petrified Forest. 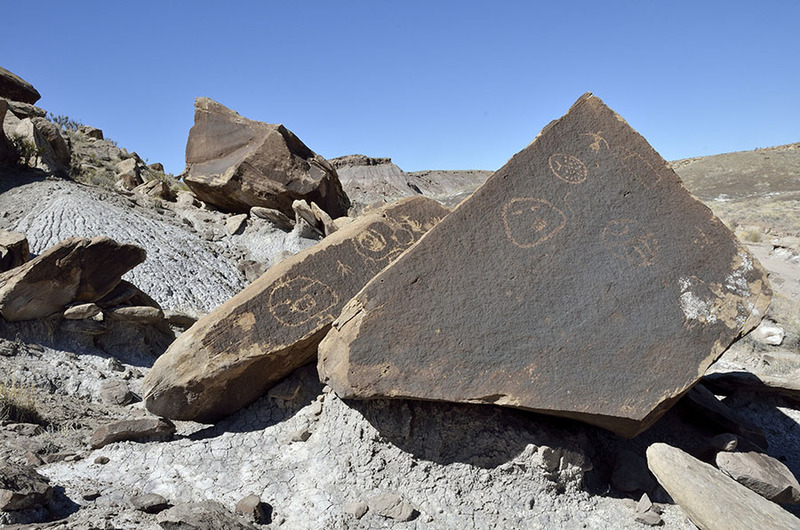 Homolovi State Park was established to protect Hopi ancestral burial and archaeological sites from vandalism, destruction and theft. 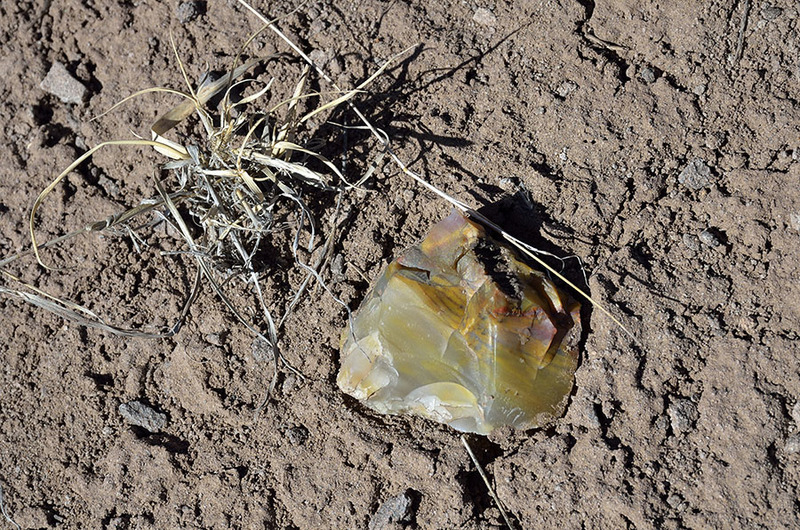 Prior to becoming a protected area, artifact hunters actually brought a backhoe into this area to dig for illegal treasures. Horrible! 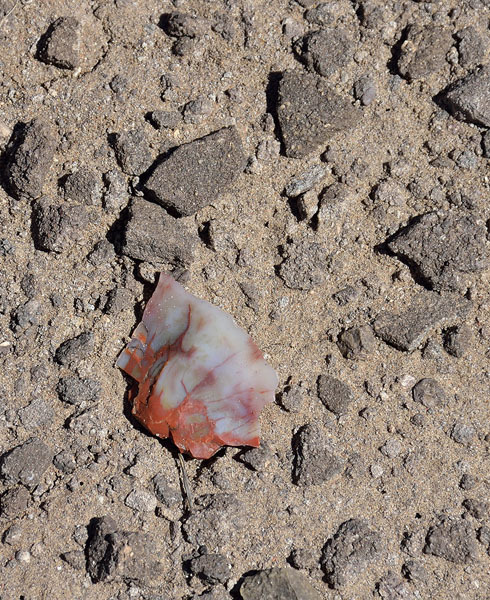 At least this area is now more secure, though many other native ancestral sites continue to be violated. 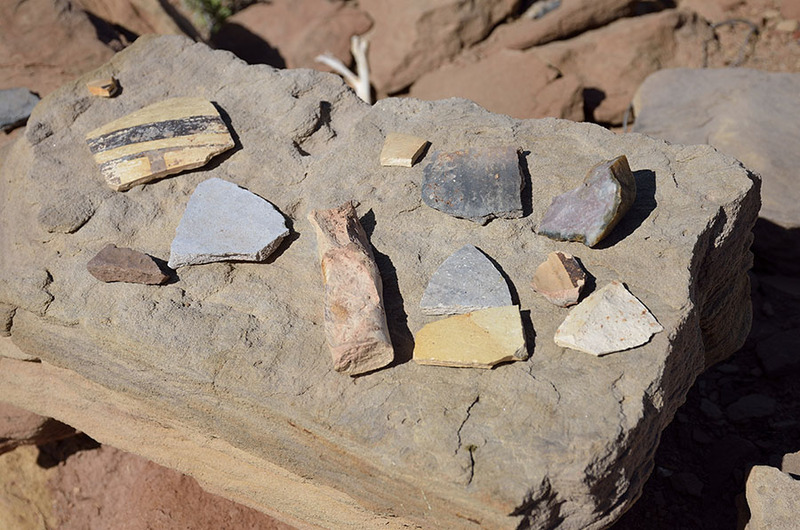 Visitors can not remove anything from these sites, but they are allowed to place pot shards in groupings like these to make it easier for others to see. 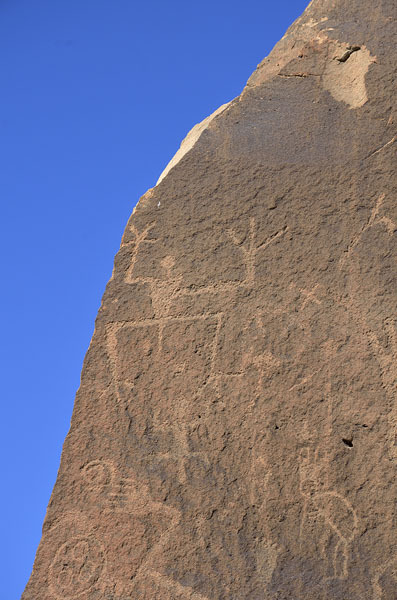 The native people who lived here did so from 620-1400 AD, coming and going as the nearby river periodically flooded. 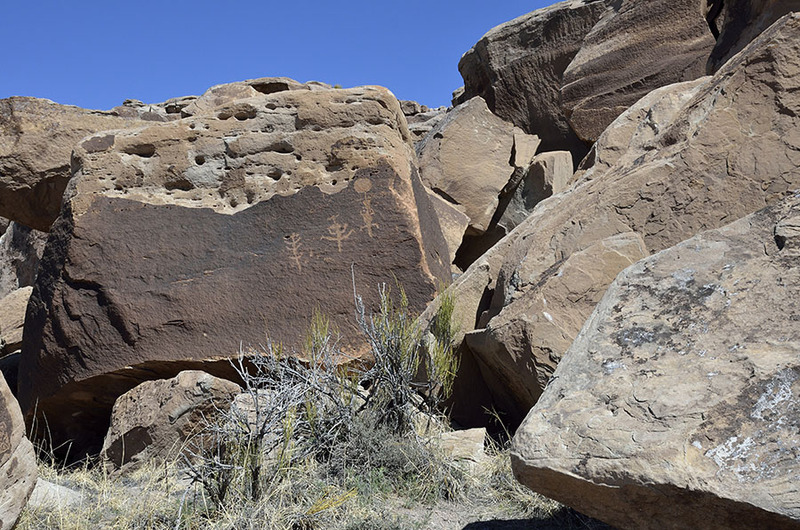 Homolovi isn’t a very big place in terms of archaeological sites to see, but it was interesting to see the culture and history, and learn about the shocking extent of theft. 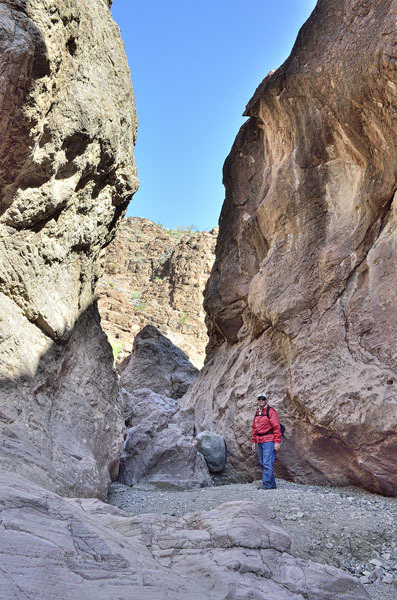 Now it was time to start heading back west, so we checked out the area around Lake Havasu at the Arizona-California border for a little while. 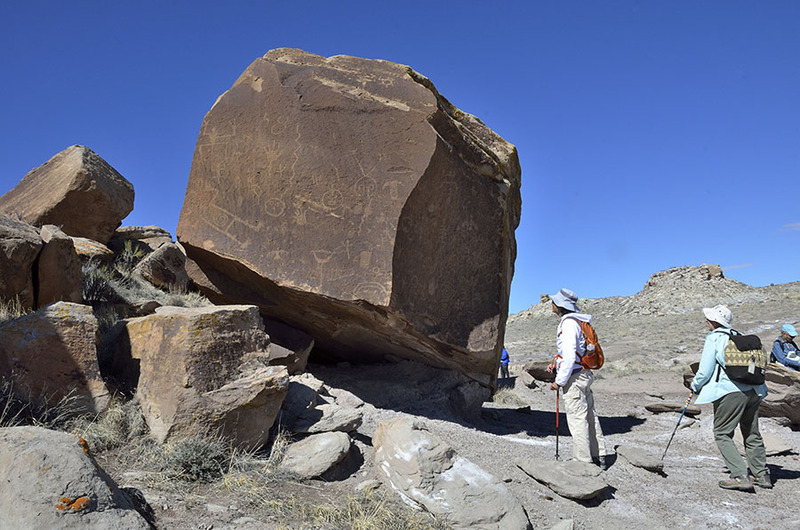 The hiking trail we chose was just okay – through a series of dry washes that gradually became dry waterfalls eventually blocked by high water. Once the scrambling and climbing got too vertical, I voted to turn back! 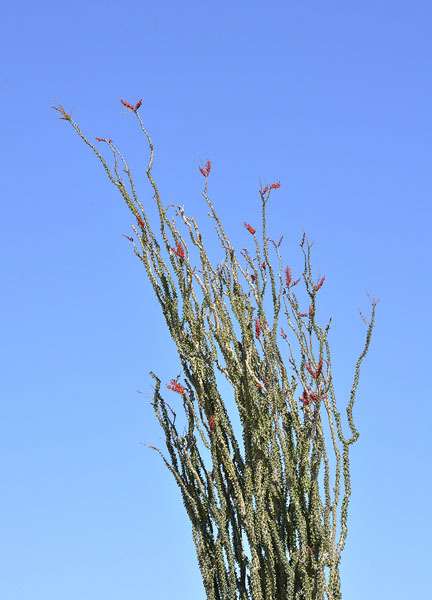 …I spotted some ocotillo that were in full leaf and flower. 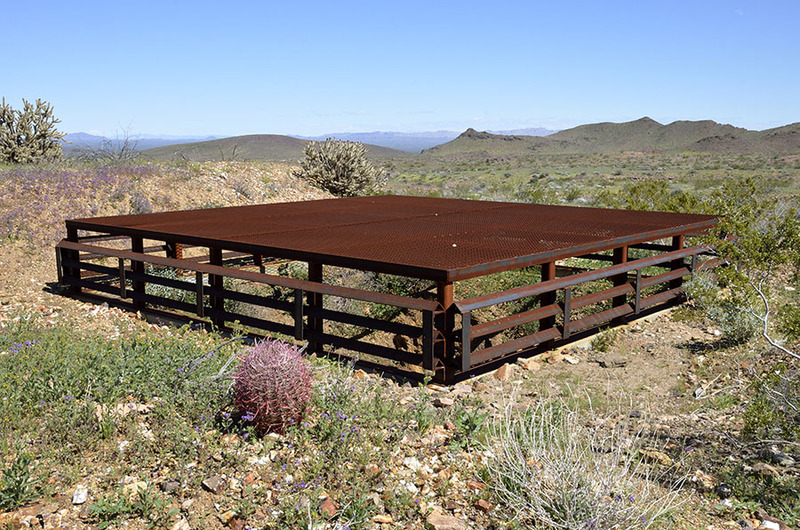 Remember back when we were in Organ Pipe Cactus National Monument and I talked about the ocotillo shrub/tree that adapts to dry spells by losing all its leaves? 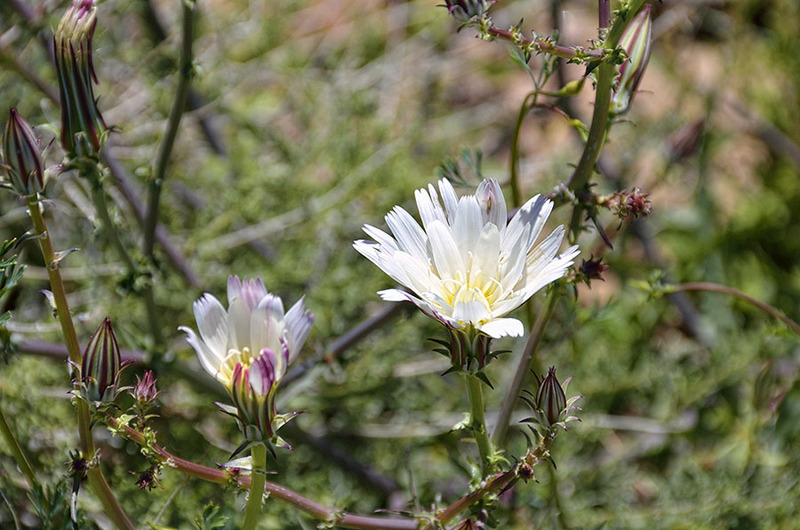 It looks like a cluster of dead sticks until there’s rain – then it will suddenly sprout little leaves all over its branches, and produce a red flower at the ends. Pretty neat. 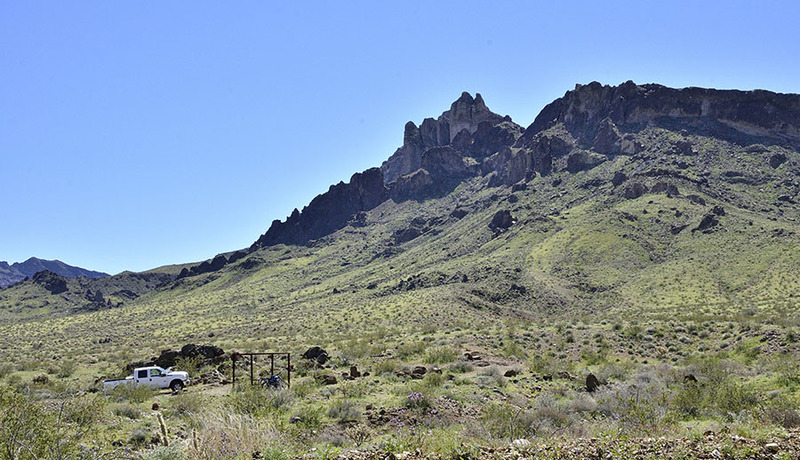 At the far end of that long dirt road we found remnants of the Lost Arch Mine, including the main shaft that was capped with a structure that allows bats and other wildlife to move in and out. 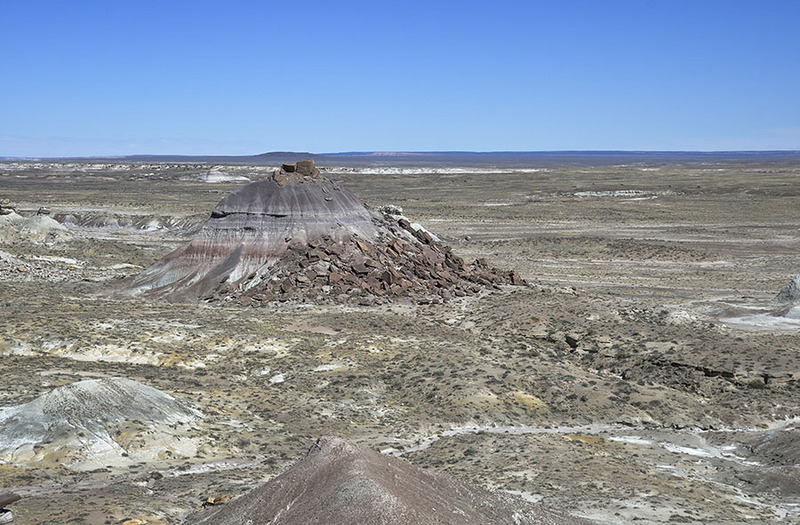 The Turtle Mountains were right in front of us, and we decided to hike the trail up and around this cluster of eroded volcanic peaks. 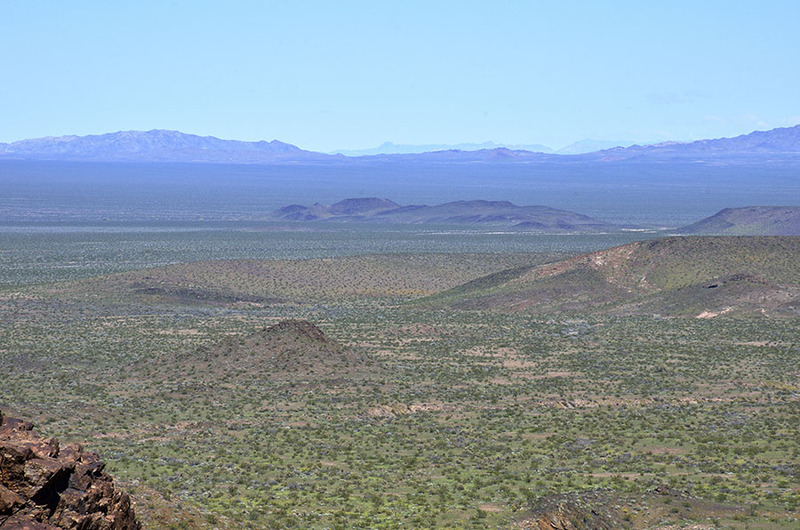 As we came up the ridge we spotted this huge depression crater to the north. 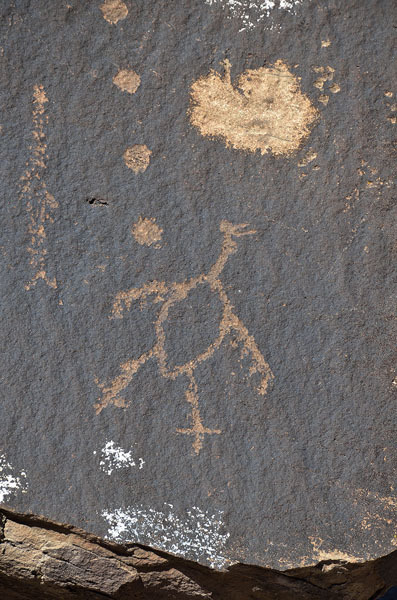 I’d love to know more about its story. We learn things when we hike, but often leave with more questions than answers. 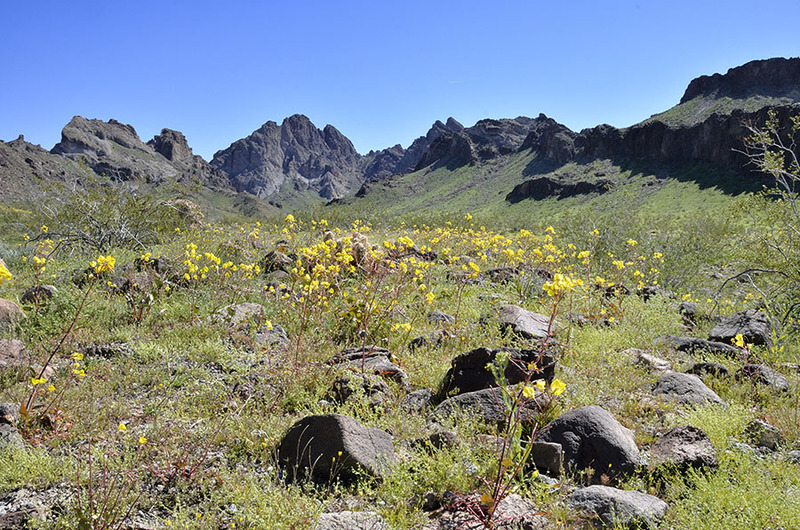 The mountain sides were covered in carpets of wildflowers, especially on the west face, and the view stretched for many miles. 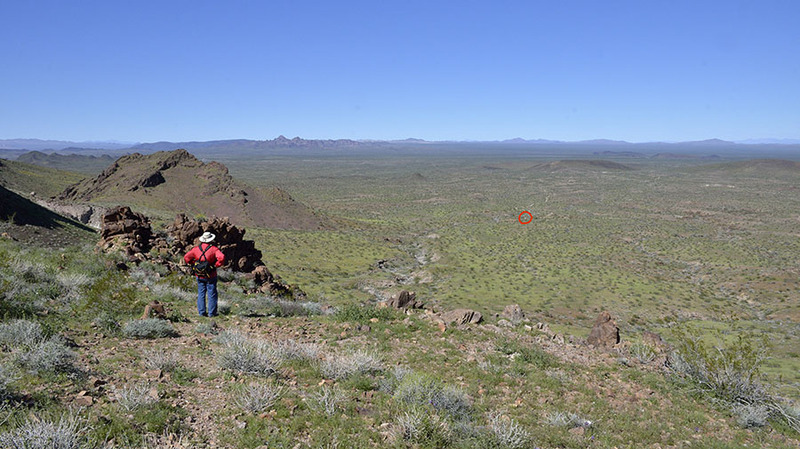 …and the little red circle is where our truck is. The trail here is not used very often – it was rather faint and we had to back-track a few times to find the easier way down. What a fabulous set of adventures! 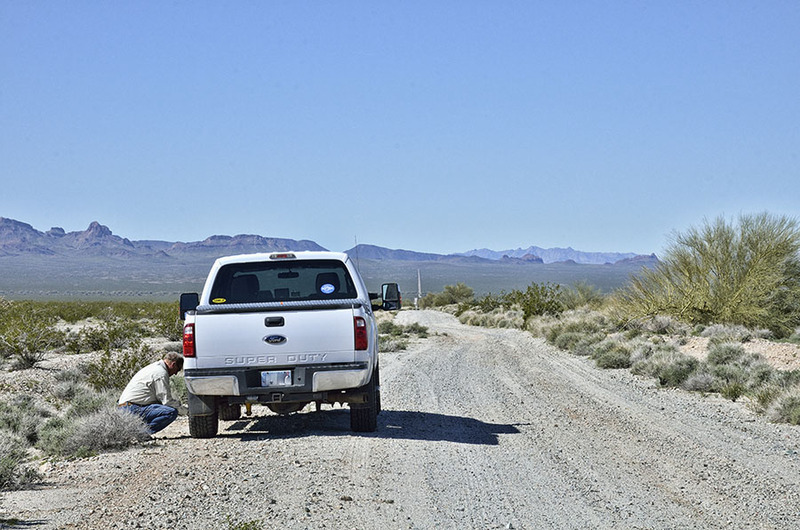 But it was time to point the truck north and head for home. 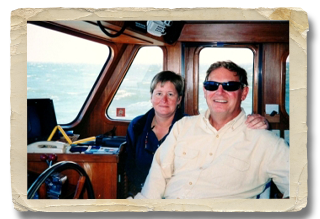 Spring is upon us, and now it’s time to get the boat ready for cruising. And more adventures. 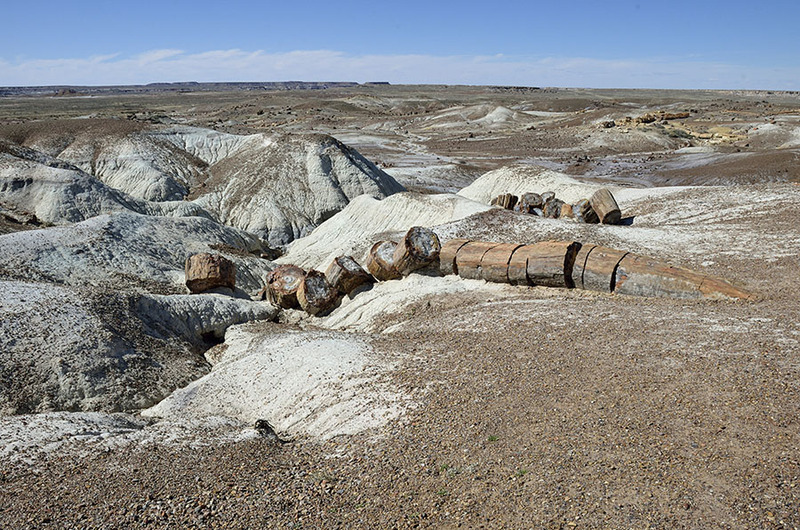 After waxing poetic about the Painted Desert and petroglyphs in Petrified Forest National Park, now it’s finally time to close out our two day adventure with a focus on petrified wood! 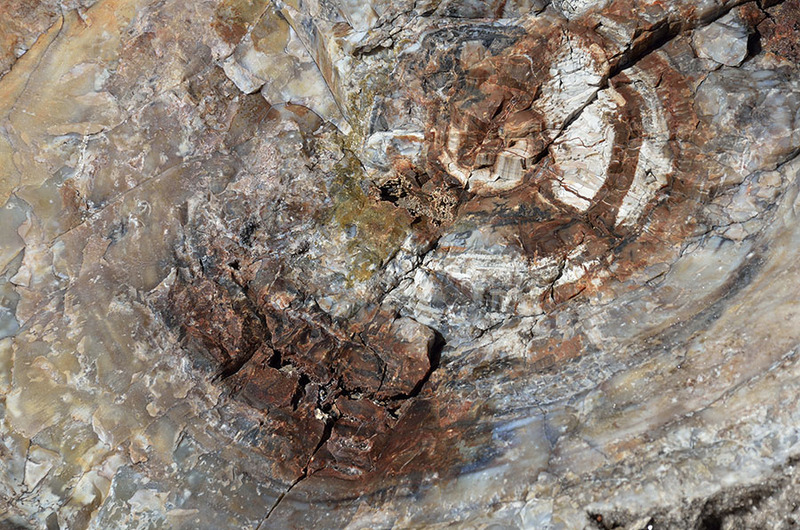 Wood fiber is replaced by silica (or calcite) to become “petrified”. 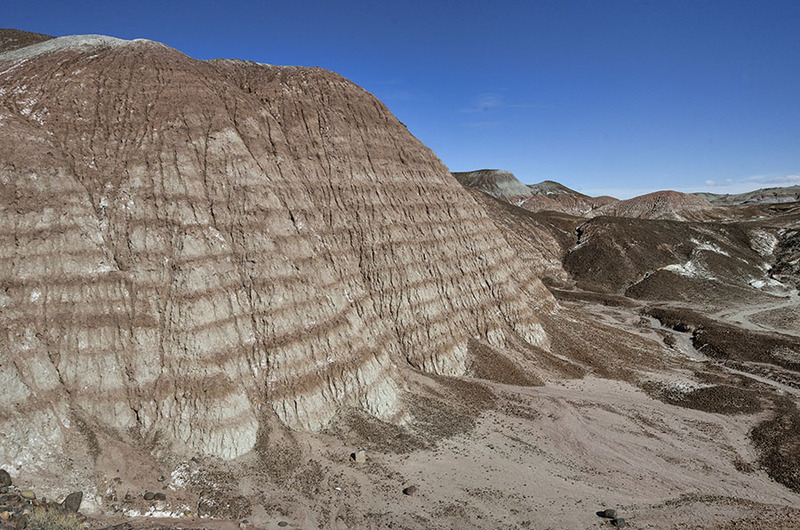 Submerged in water and buried under volcanic ash (which is loaded with silica), organic tissue buried in sediment decays until the oxygen in the surrounding water is consumed. The decay process releases carbon dioxide, which combines with water to form carbonic acid… making the water around a submerged log slightly acidic. If the water contains silica, the silica will precipitate out and become incorporated into the wood’s cell wall. 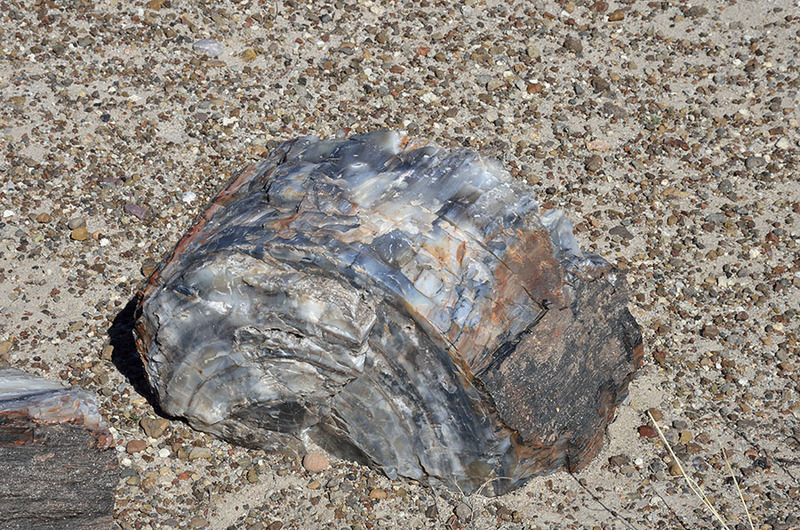 Voila – petrified wood! 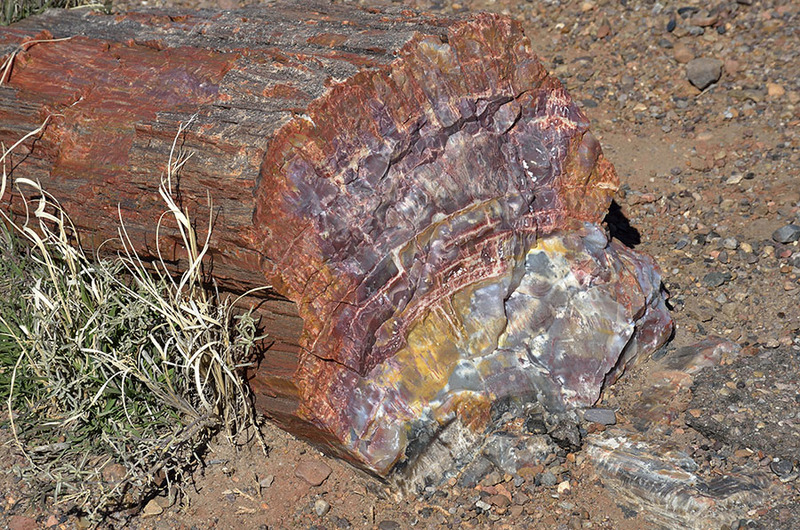 The rangers told us that there are examples of petrified wood in all 50 states. 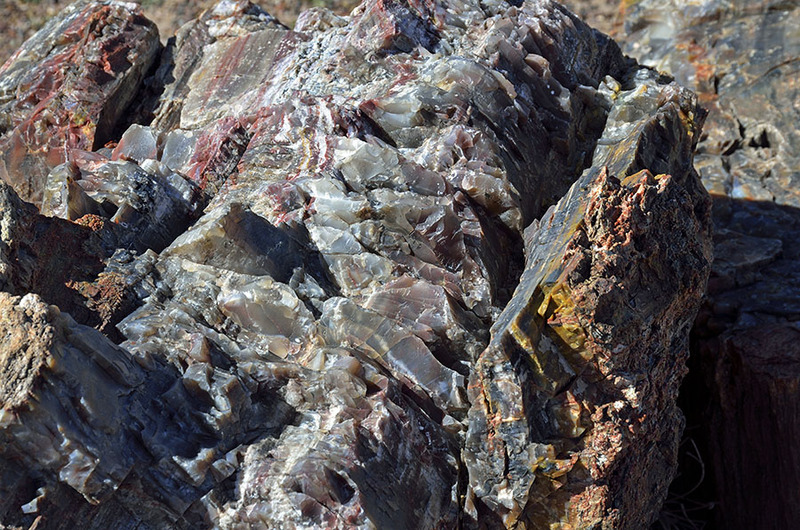 The various colors are produced by different minerals – reds and pinks come from hematite (oxidized iron), yellow, brown and orange come from goethite (another type of iron oxide), green comes from iron (mostly from meteorites), white is pure silica, black comes from organic carbon or pyrite, and purple or blue comes from manganese dioxide. Chemistry surely produces a magnificent palette! 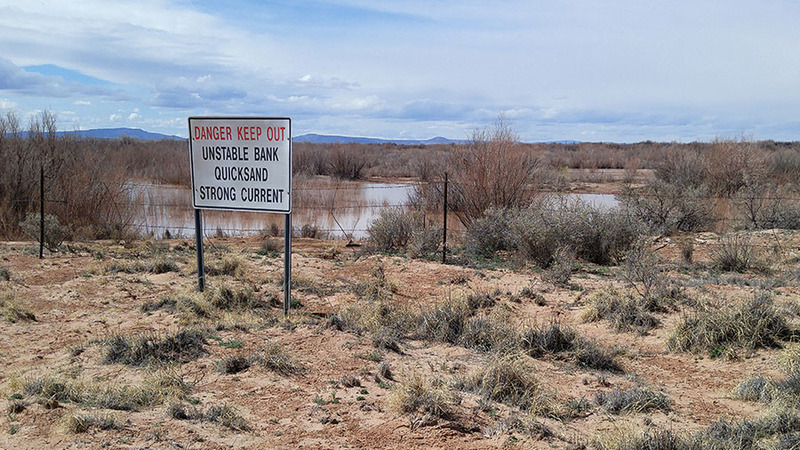 Remember, this is high desert – over 5000′ in altitude. 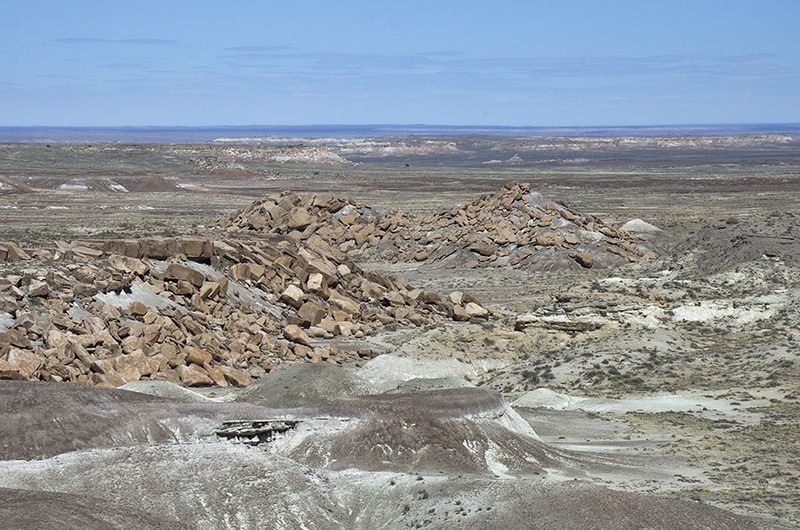 You can see how the caprock crust crumbled leaving softer, almost silty ground layered with mineral colors. 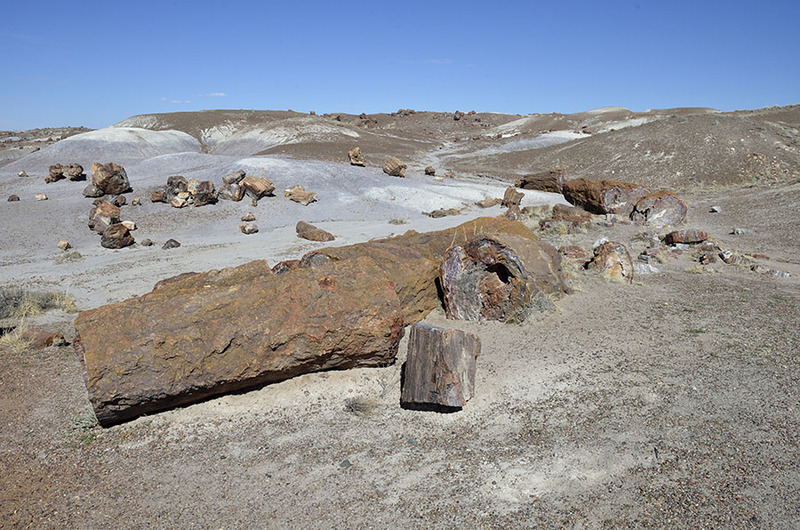 As the ground erodes, the petrified logs are uncovered. 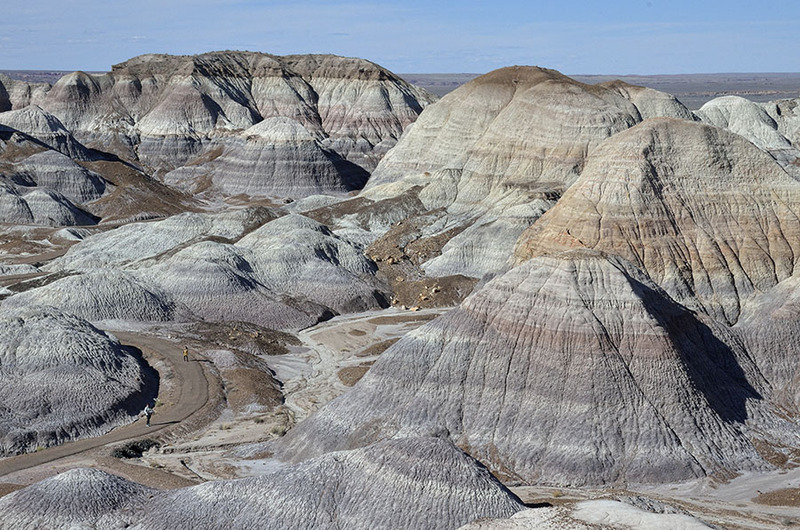 As you look around the landscape there are many cone-shaped hills stratified with color. The patterns of the land fascinates with every turn. 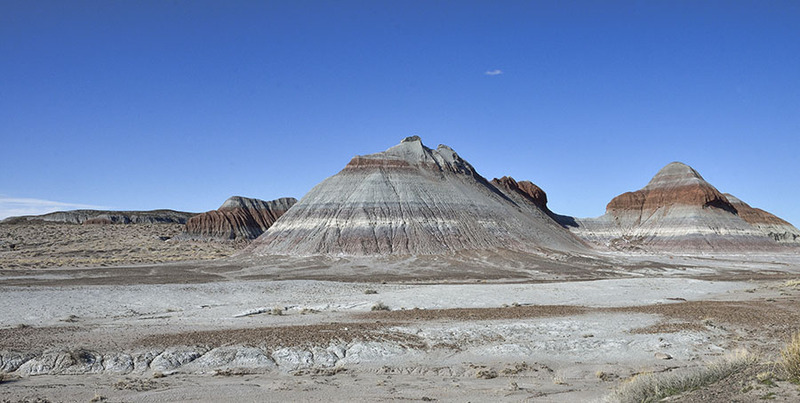 …and some unique colors in the Blue Mesa area. 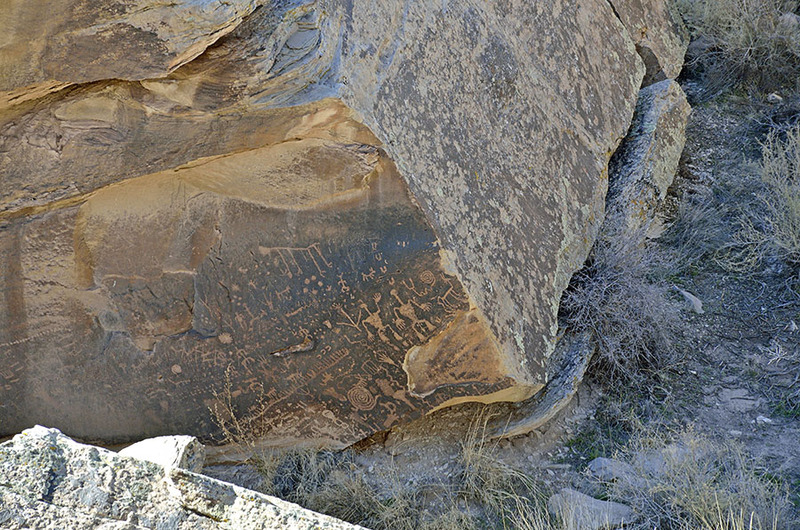 Can you spot the people walking on the trail below? We wanted to go explore down there, but after the long hikes earlier in the day and the previous day we were too tuckered out. 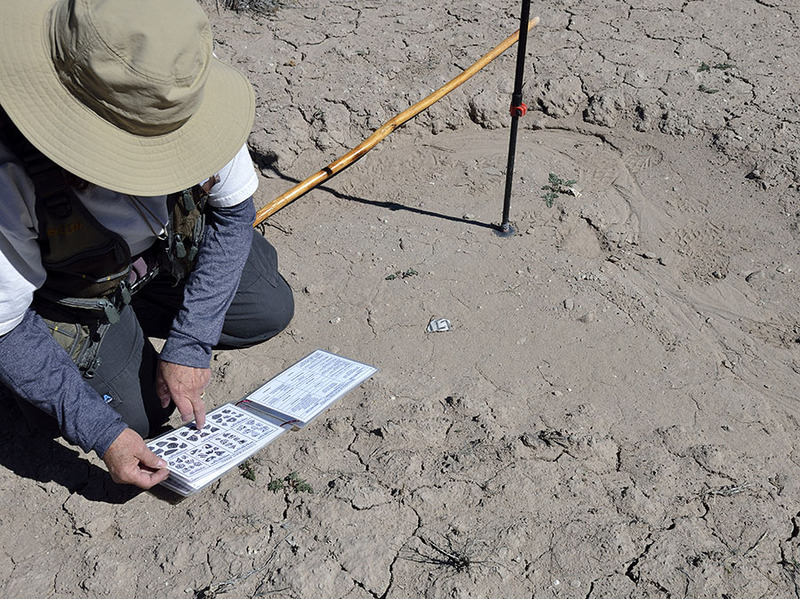 It’s okay to leave something to investigate the next time. 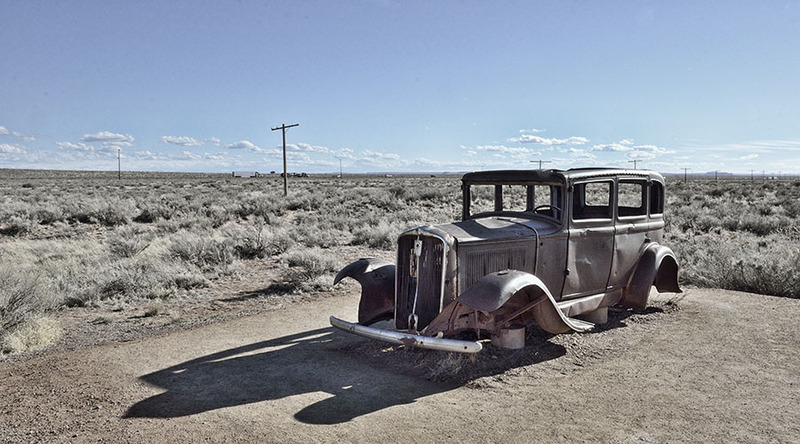 Lastly, we stopped to see a little memento of historic Route 66 which runs through the park. 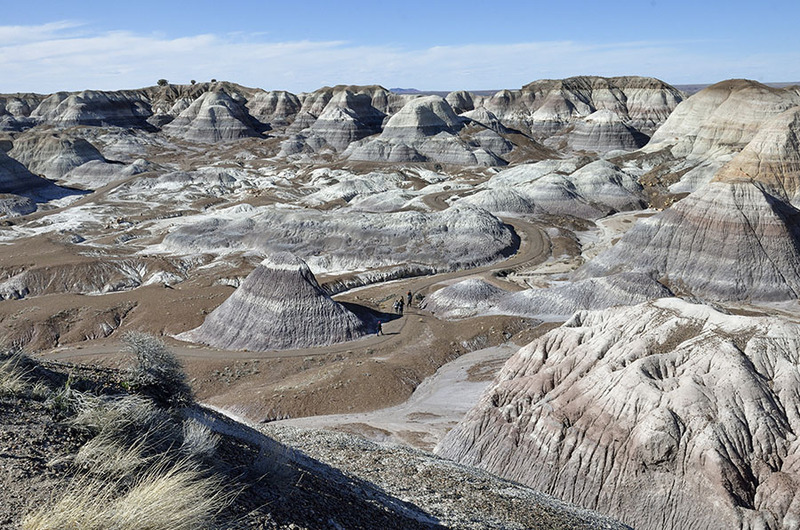 Day 2 in Petrified Forest National Park found us once again on a ranger led hike, with the same rangers as the day before. 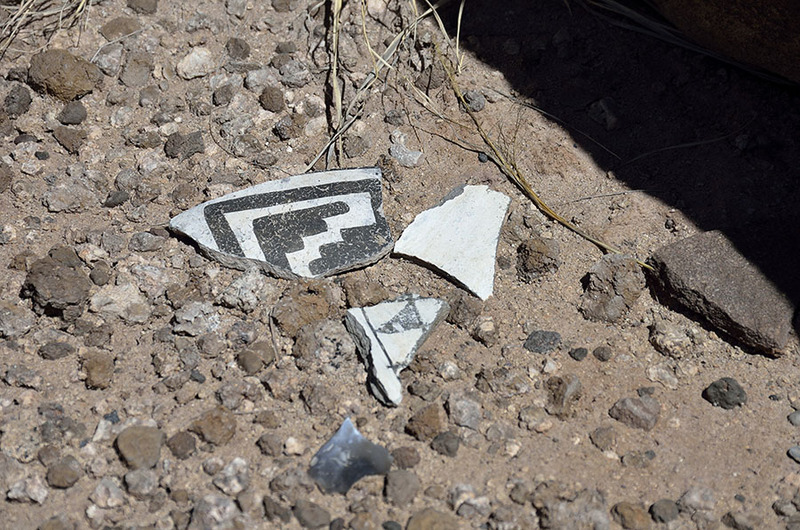 This time we were on the south side of I-40 in a different part of the park, and the day’s objective was to find petroglyphs and some native pot shards. Our hike the previous day had only one other person, but this hike was full with 16 people plus the guides! 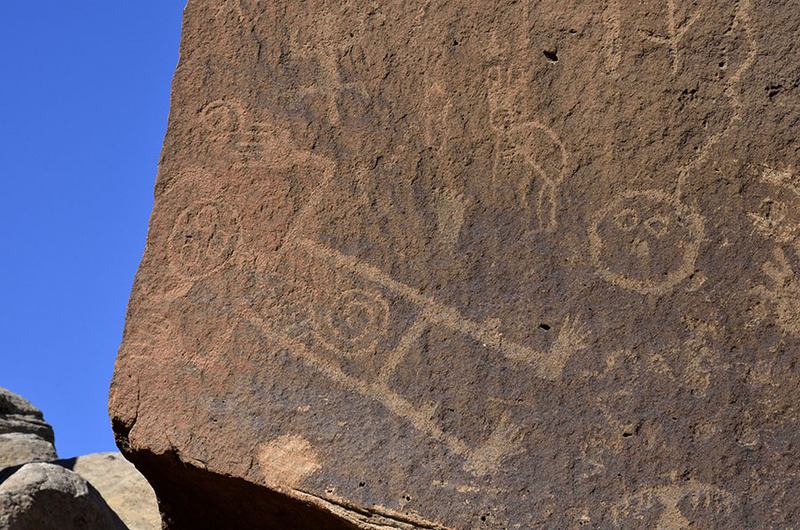 Apparently the local Arizona residents get super-excited by petroglyphs and pot shards, so hikes like these are filled months in advance. 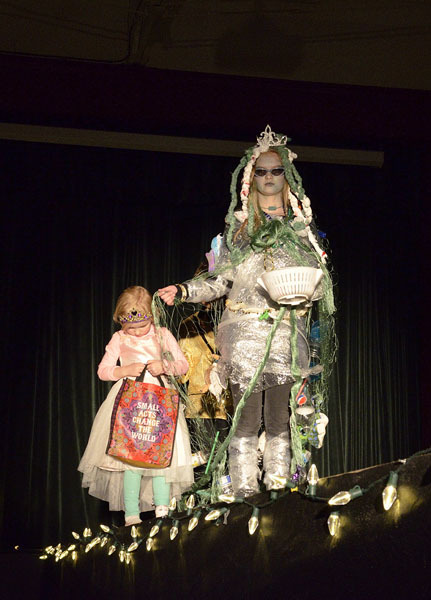 …and all other manner of images. Once we learned to spot them we found them all over the place out there. 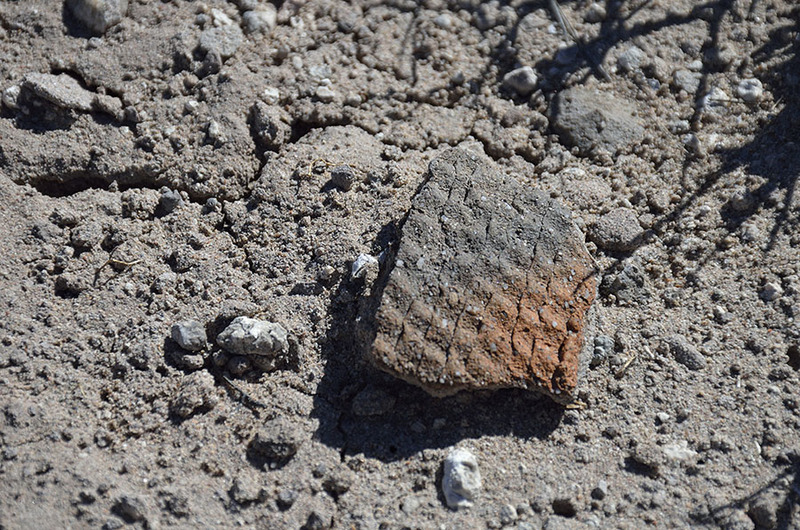 In addition to the petroglyphs, we saw some interesting pieces of broken pottery. One lady had a book that showed many of the styles to help identify the century when things were made. …and the fancier kind was painted and decorated. The piece she looked up was probably made in the 13th century. Now I understand why these kinds of hikes are so popular! 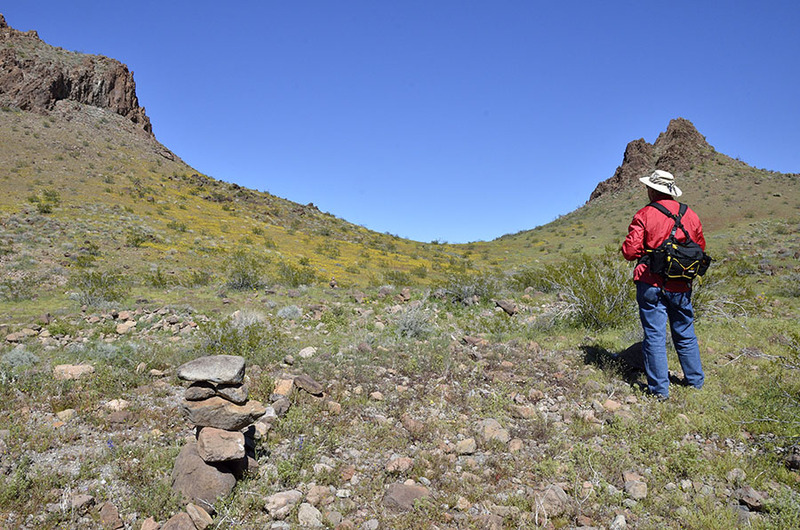 After a much-needed pause for lunch, we continued our long elliptical path around Martha’s Butte. 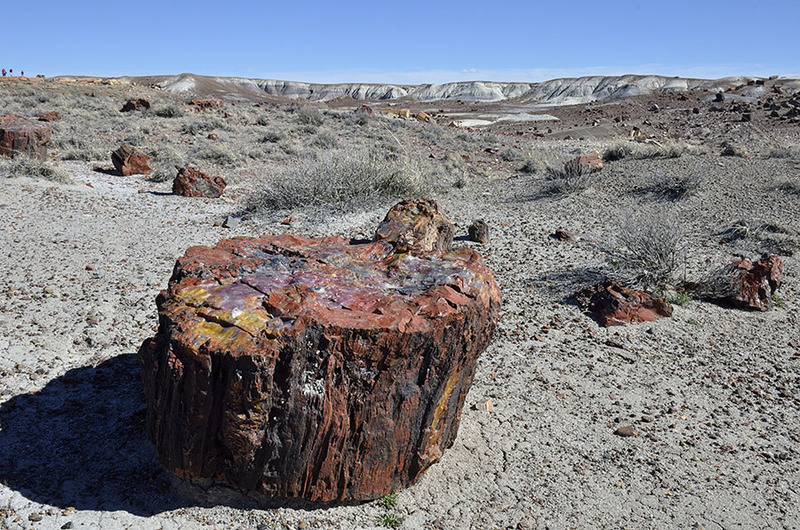 We climbed up some bentonite hills to get a better perspective, and the rangers found some petrified wood that had been worked into tools by Native Americans. 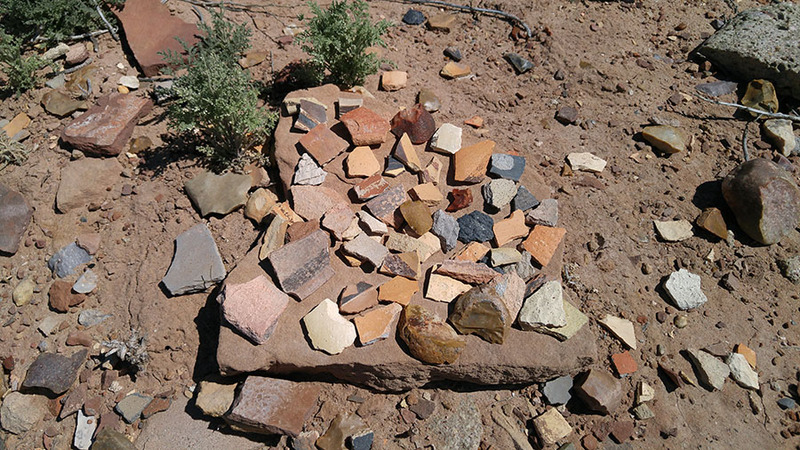 Even the scattered pieces of petrified wood up there (about 5700′) were bright splashes of color against the soft brown of the ground. 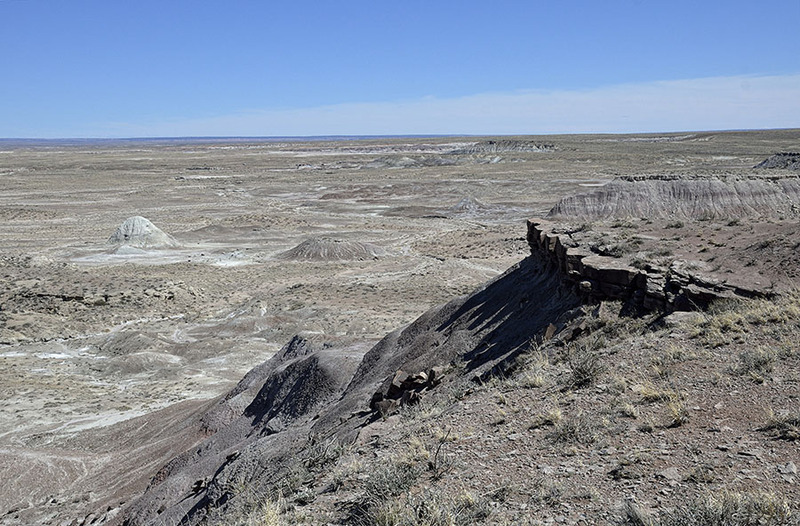 Just as with the Painted Desert badlands, the basalt caprock has cracked and crumbled away to reveal the soft bentonite which is easily eroded. 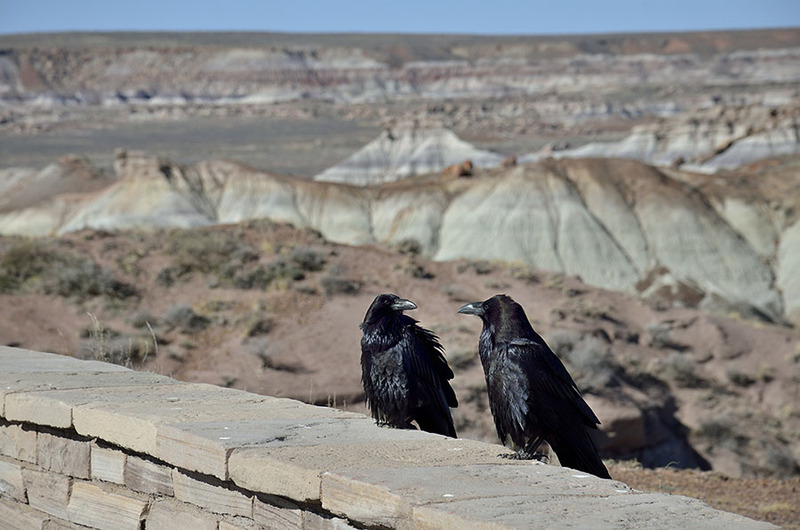 The ravens agree with us – it’s a fantastic place… and yet there’s STILL more that we saw after the long hike… stay tuned.